Which U.S. House Race Is The Best 2018 Bellwether? micah (Micah Cohen, politics editor): Greetings, friends. It’s a snow-day politics chat! This week, we’re pilfering a great idea from RealClearPolitics elections analyst Sean Trende (dear readers, if you don’t read Trende, you should). So that’s the basic idea. We’ll each offer a district one by one and then discuss why we think it’s likely to capture the national mood in 2018. I drew names out of a hat. Clare, you’re first. clare.malone (Clare Malone, senior political writer): I choose California’s 45th Congressional District. It’s held by Republican Mimi Walters, but Hillary Clinton won it by 5 percentage points in 2016. It’s in the general Los Angeles area, and it has the suburban voter types who I think are the sort that we’ve seen be more persuadable to the Democratic side in the special elections we’ve had since President Trump’s election. I’m interested in that particular group of voters this year and think the California 45th would give me a decent handle on them if it were the only race I were allowed to know the result of. 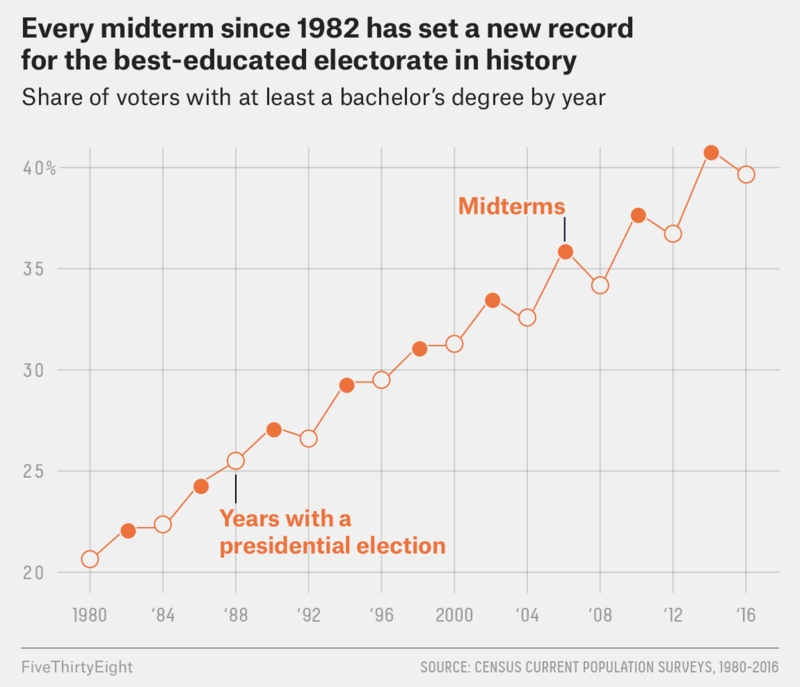 The midterms could be a fascinating time to see if it’s a trend — college-educated voters moving more to the left on the political spectrum and finding a more permanent home with Democrats, especially after a tumultuous couple years of President Trump. micah: To be clear, these suburban voters moved toward Democrats in 2016, and seem to have stayed there in the special elections, but haven’t moved more toward Democrats since 2016.
nrakich (Nathaniel Rakich, FiveThirtyEight contributor): Well, in Pennsylvania 18, Conor Lamb outperformed Clinton in Allegheny County — the most suburban part of that district — by 19 points. Of course, he outperformed Clinton everywhere, but it shows that Democrats can do better among suburban voters than Clinton did. nrakich: Yeah, they are going to turn out. I agree with Clare that California 45 is an ideal test case for them. perry (Perry Bacon Jr., senior writer): So Walters won by 17 percentage points in 2016, though. It would take a big swing for Democrats to win it. I think that gap will narrow, Perry, is my general point. nrakich: And Republicans are in danger of getting shut out of the general election in both the gubernatorial and Senate races in California, thanks to the top-two primary system. California could have two Democrats facing off in the general election in statewide races. Without a Republican at the top of the ticket to drive GOP turnout, House Republicans like Walters could be in real trouble. clare.malone: I guess this is also a good time to point out a piece from our dearly departed Harry. He wrote about how Democrats focusing on Republican-held seats in a few very blue states could swing the House for them. It’s another reason I’m more confident about this being a close one. nrakich: Well, Walters seems like a strong incumbent. But I think it’s also going to be valuable to know how strong incumbents do in 2018. Will they get swept away in a broadly anti-Republican wave, or will voters still consider the merits of individual candidates? That’s why I think California 45 is a better pick than California 49, for instance. perry: Where Darrell Issa is retiring. clare.malone: Yeah. I skipped a lot of races in the toss-up categories in Cook Political Report’s ratings because I thought the incumbents were too well-known. I kinda want an under-the-radar candidate to tell me something. Not like, Dave Brat or Karen Handel. micah: OK … Nathaniel, you go next. So far, Clare is winning! nrakich: In the proud FiveThirtyEight Slack chat tradition, I am going to cheat and pick two districts! micah: You see what kind of example you set, Clare and Perry? clare.malone: Micah, I am a consummate rule follower. nrakich: Partly because I don’t want to repeat the points that Clare and Perry have/will make, but also partly because I am interested in this question of whether 2012 or 2016 is the correct baseline for the nation’s default political makeup/geography going forward. The two districts are the 2nd in Maine, home of Republican Bruce Poliquin, and the Illinois 6th, home of Republican Peter Roskam. Maine’s 2nd District is the epitome of a white, working-class district that shifted from then-President Barack Obama (who won it by 9 points in 2012) to Trump (who won it by 10 points). According to census figures, it’s less well-off and has lower levels of education than the nation overall, with a median household income of $46,638 and only 23 percent of residents with bachelor’s degrees. Going by election results from 2012, when Democrats did not quite as terribly with voters with less education, this should be an easy Democratic pickup. Going by results from 2016, when Democrats did much worse among voters with less education, it’s a reach. So knowing who wins it in 2018 would tell us pretty clearly whether Democrats can compete in white, working-class areas again. Illinois 6 (northwest of Chicago) is sort of the opposite principle: It is very well educated (52 percent bachelor’s degrees) and wealthy ($97,387) and went from supporting Mitt Romney (+8) to Clinton (+7). If we know Democrats are winning there, maybe the suburbs are the true path forward for them. micah: Are we getting competitive races in both, you think? nrakich: Well, that’s the question! Right now, yes, both are rated as competitive by outlets like Inside Elections/Cook Political Report. micah: Lemme rephrase: Are we getting contested races in both? nrakich: Yes. In Illinois 6, scientist Sean Casten will be the Democratic nominee. And in Maine 2, Democrats have two interesting candidates in conservationist Lucas St. Clair and former Susan Collins staffer Jared Golden. clare.malone: By the way, Nathaniel, you’re not the only one who thinks Maine 2 is interesting! I went up there in September 2016 and did a story about its shift. nrakich: I loved that story, Clare! Maine 2 is beautiful and interesting, and I love visiting there whenever I can. clare.malone: And you’re right: The Obama-Trump voter is the big question mark, not just for the midterms, but also for two years from now for any Democratic candidate. nrakich: One more thought: If Democrats win BOTH of my races, then “whoa, Nelly.” Wave time. And if Republicans win both, it’s clearly been a disappointing night for Democrats. micah: So I guess because Trump is so unpopular, I would sorta expect the GOP’s gains among white, working-class voters to revert to the mean a bit in 2018 and for Democrats to still overperform among college-educated suburban types. nrakich: I agree that it will be a mix of both. micah: That might not get Democrats both districts, but it’s not like they have to pick one or the other. nrakich: No, of course not. But I purposefully chose districts that were roughly equally Obamay-Trumpy and Romneyey-Clintony. nrakich: Whereas a district like the 32nd in Texas (Pete Sessions’s district, which Romney won by 16 but Clinton won by 2) might flip only if 2016 results are MUCH more predictive than 2012 results, only a slight bias toward one of those years would probably be enough to lift either Maine 2 or Illinois 6 closer to the top of Democrats’ target lists. clare.malone: This whole question of flipping voters in Maine 2 back toward Democrats … it’s basically what Joe Biden’s potential candidacy will be based on. Not to turn this too much toward 2020, but it’s why you saw him stumping hard for someone like Conor Lamb in the Pittsburgh area with a lot of white, culturally conservative voters that Maine 2 has a lot of (big Second Amendment place). Anyhoo! JOE BIDEN is scheduled to meet with the Blue Collar Caucus, a group of House Democrats led by Reps. Brendan Boyle of Pennsylvania and Marc Veasey of Texas. This is subject to delay, if the Capitol is closed today. clare.malone: Very 2006 Howard Dean Dems! micah: I didn’t know there was a Blue Collar Caucus! clare.malone: I mean, it just sounds like a rebranding of the Blue Dogs. nrakich: Hm, I would be careful conflating Blue Dog and Blue Collar. Bernie Sanders appealed to a lot of blue-collar folks, for instance. But I generally agree with Clare re: Biden. micah: Blue Dog is more moderate. nrakich: Right. Blue-collar can refer to hard-core workers’ rights voters, for instance. Less the Second Amendment voters. micah: Yeah, that’s fair — maybe similar demographics but Blue Dogs are more conservative on social issues while Bernie-types just de-emphasize them. But blue-collar can refer to both. clare.malone: Same Coca-Cola, just a new bottle. micah: ok, Perry, you’re up! perry: I chose Virginia’s 10th Congressional District, currently held by Republican Barbara Comstock. This is somewhat similar to Mimi Walters and to the broader theme that Republicans might have trouble in districts near big cities (Comstock represents a suburban area near Washington, D.C., that is full of federal workers.) She won by 6 percentage points in 2016, but Trump lost there by 10. Strong incumbents like Comstock survive by saying that they are not part of the broader party (she voted against Obamacare repeal, for example). 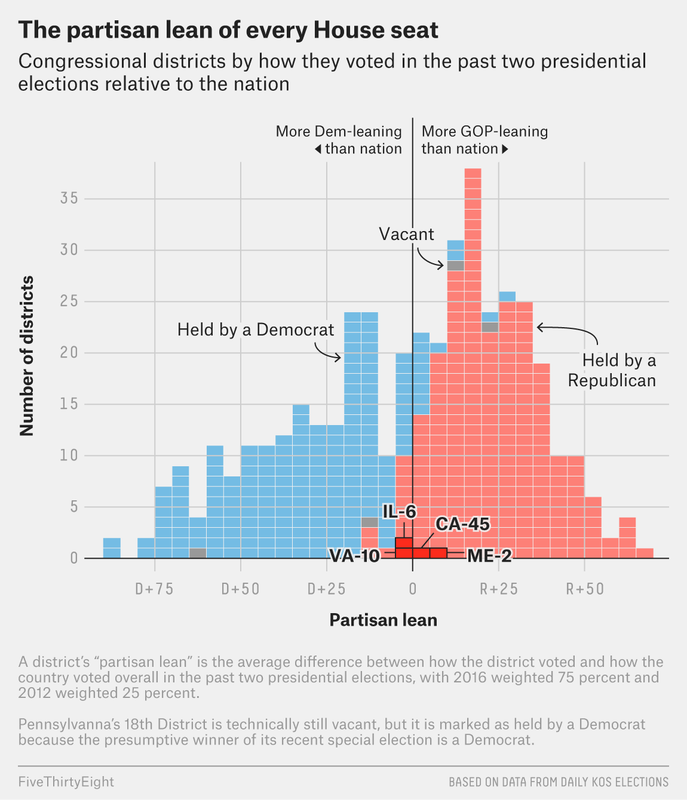 Incumbents hold onto some districts that are drawn favorably toward Republicans. This won’t necessarily happen in Virginia 10, but maybe Democratic primary voters in several districts pick candidates that are too far left to win in the general election. clare.malone: I like that you’ve picked this since it’s an anti-Democratic wave angle, and it deals with the problems of “progressive Dems vs. establishment Dems” that could harm them in a move from the primary to the general. nrakich: Who do you think their best candidate is? perry: State Sen. Jennifer Wexton, from Loudoun County, seems like a most ideal candidate for the general election. Gov. Ralph Northam endorsed her, I assume in part because some of the other Democrats in that race are raising a lot of money. nrakich: FWIW, the Wexton campaign just released a poll giving her a 26-point lead in the Democratic primary. perry: Interesting. I had not seen this poll. micah: Well, it’s from the Wexton campaign, though. nrakich: I mean, it’s a campaign internal, so take it with a grain of salt. nrakich: Although that’s a big lead. Nate (Silver) found several years ago that internal campaign polls overstate a candidate’s position by about 6 points. micah: This is interesting. Democrats chose the ideologically “safer” bet in the Illinois 3rd primary on Tuesday. So maybe they’ll limit self-destructive impulses. perry: I’m not totally convinced that voters in a general election care about or can tell who is a moderate versus a liberal Democrat (or a moderate versus conservative Republican), but I tend to think that people who have run before are better candidates generally, like a state senator has done some of the basics of campaigning and has won a general election before. perry: Broadly, I think if a Comstock-type candidate can survive, that tells me that maybe a few other smart GOP incumbents will and that maybe Democrats will fall four to five seats short of winning control of the House. nrakich: I agree that knowing that Comstock will win would be valuable information today. But if the info we gain is that the Democrat beats her, I’m not sure how much it tells us about whether Democrats are going to flip the House. Going by FiveThirtyEight partisan lean, Virginia 10 is the 179th-bluest seat in the country. So Democrats could win it and still fall short in other areas. micah: Well, but maybe Comstock winning is one of the few routes the GOP has to keeping the majority. So it’s sorta like — incumbents overperform or bust. nrakich: I think her winning would be a very good sign for them. But I think there are lots of ways that Republicans could keep the majority even while losing Comstock’s seat. And let me throw some reader suggestions at you all and tell me if any stand out. I would pick my district, CA-25. It’s been Republican for many years, but went for Clinton in 2016. The district is shifting from white/rural to suburban with more diversity. Mentioned in the other thread, but I’m currently most interested in NY-19. OH 12 weighted R but retirement means may open but only to true wave. nrakich: The Ohio 12th! Bold. What about your pick, Micah?? clare.malone: Texas 7 is interesting. Trump lost by small margin, suburbs. It’s kinda the same thing as my California 45 pick. Will educated conservatives swing? perry: So some suburbs (the Florida one is Miami area, for example) but some interesting ones. I don’t know districts by number, Minnesota 8 is not a suburban one really and is very white. clare.malone: I think they just picked Ohio 12 because it’s open? That one will probably go Republican. nrakich: Open seats aren’t useful info to know, though. The vast majority of seats up in 2018 will have incumbents. Democrats will have to beat Republican incumbents to win the House. We already know they do well in open seats thanks to special elections. micah: Perry, I can’t believe you don’t have all the districts memorized. I couldn’t tell you who reps New York’s 5th. perry: Kentucky 6 was one of my wild cards. Lexington area. nrakich: If we could know the margin of the seat we picked, we would know a lot more … obviously.